Many of us moms have traveled alone with our babies. It’s hard work even if you’re not alone. From packing everything up, hoping the baby stays calm and quiet during the travel time, and wishing that no other travelers feel uncomfortable – it’s not an easy task. Few of us moms, however, may have had the wonderful experience that new mom Rebekka Garvison recently had on a flight from Chicago to Atlanta. She and her four-month-old daughter Rylee were on a 5:30AM flight and heading to see Garvison’s husband, Rylee’s dad, in Alabama where he is stationed as an Army firefighter. Garvison was calm and collected preparing for the flight while juggling the infant, packing up the stroller, wrangling the diaper bag and carry-on luggage but when Rylee began to fuss, she tried her best to not disturb the fellow passengers. Instead of staying in her seat with a crying baby, she asked a flight attendant if she could move a few rows up, where there were two empty seats available. The flight attendant allowed her to relocate and that’s where she met Nyfesha Miller, whom Garvison refers to as an angel. Instead of rolling her eyes or exhaling sounds of annoyed sighs, Miller offered to help Garvison and asked if she could hold the baby. Rylee began looking out the window and soon fell asleep in the stranger’s arms, and stayed there peacefully for a large portion of the flight. While Rylee slept, Miller and Garvison made quick friends, chatting and talking. Miller even told Garvison that holding Rylee was a comfort to her, too. Miller continued holding sleeping Rylee as they arrived to the gate and this allowed Garvison to retrieve her stroller and luggage knowing that her baby was in good hands. Imagine that! 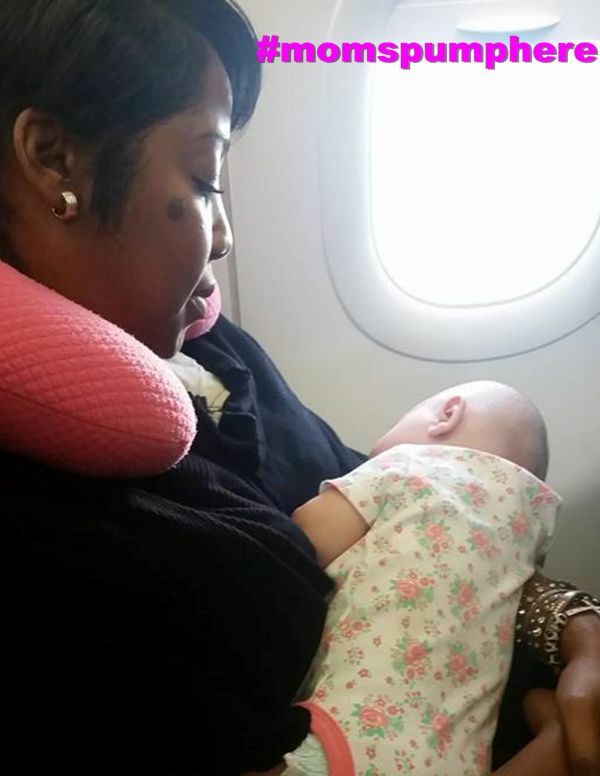 A stranger holding your baby during a flight and not being annoyed or bothered, but telling you she feels comforted! What a wonderful moment shared among these three ladies! Garvison shared her story on social media in September and it has quickly gone viral. Have you ever been helped by a stranger?